It had been such a perfect summer. My wife Posie and I decided not to travel abroad this year but to stay local and make the most of all that New York and its surroundings had to offer – especially in the great outdoors. And with a series of picture-perfect weekends, it was truly a memorable season. From a musical perspective alone, we enjoyed an astonishing variety of entertainment: Basement Jaxx playing their first U.S. Concert free in Central Park; Moby’s Area One Festival with Outkast, Nelly Furtado, Carl Cox and the Orb at Jones Beach; Cheb Mami and Transglobal Underground free at Prospect Park here in Brooklyn; the first ever Siren festival at the newly revitalized Coney Island, another free Brooklyn event on another glorious Saturday with Guided by Voices, the Jon Spencer Blues Explosions, Peaches and more; the Africa Fest in Prospect Park, the annual finale to the free Celebrate Brooklyn concerts, headlined by Baba Maal and a treat to take children to; the Warped Festival at Randall’s Island and Rod Stewart at Jones Beach, two strikingly different Newsday assignments each enjoyable in their own way; and Radiohead and the Beta Band at Liberty State Park, one of the most beautiful locations I have attended given its backdrop of the Statue of Liberty, the Empire State Building and, yes, the World Trade Centers too. There was much other outdoor culture too: I visited the New York Botanical Garden in the Bronx for the first time, and enjoyed it so much – especially the Children’s Interactive Garden with all the model trains running through it – that I returned later in the summer. (With my boy Campbell in tow both times, of course.) Two separate weeks spent at an old converted inn in the Catskills, going on hikes, camping under the stars, having fun at the dilapidated old water theme park Zoom Flume. Djing at an annual party for Gig Records down in Point Pleasant, New Jersey, on another day of ideal weather. Making the most of our small backyard here in Brooklyn for meals outdoors with good friends and family. Spending the last two weekends of summer with in-laws down at the Jersey Shore, swimming and rowing and running and kayaking, delighting at feeling so fit and alive on the cusp of middle age. Stealing one more day of summer in after Labor Day, spending it on a beach that was both windy and deserted as if reminding us that we shouldn’t be there. Even the one football (“soccer”) match I watched all summer was too good to be true: England beating Germany 5-1 in Munich. Finally, on Monday September 10 I took my mother, who had been visiting for the last three weeks of summer, to JFK airport and onto a United Airlines flight back to England, then returned home looking forward to getting back to serious work, including updates for this web site and finally putting into place various book projects concerning New York City. And then the terror struck, and this summer suddenly feels like a distant memory from another life. It was another life. For the world I am living in has irrevocably, inconceivably changed for ever. 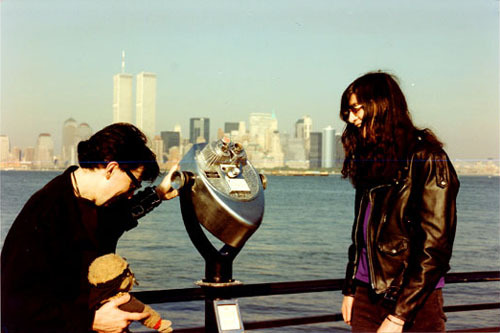 Memories of a happier time: Chris Stein and Joey Ramone at Liberty Island, October 3 1990. Picture by Neville Wells. There are so many points I want to make, so many conflicting emotions to untangle about what happened on Tuesday and how it affects us all. As I detail my summer’s itinerary, it’s clear to me what an idyllic standard of living people can aspire to in this country, a statement my mother made frequently those three preceeding weeks. It’s also painfully apparent that Americans always took this sunny and peaceful existence for granted, as if the horrors of the outside world – that which exists in other countries, overseas, in the middle east and in Africa — could never touch the mass of people within the nation’s vast borders. This overly confident sense of security had long been a painful defect of a wrongly isolationist people, and it’s been exposed now to those of us who live here as an illusion, a dream we have been forced to wake up from. 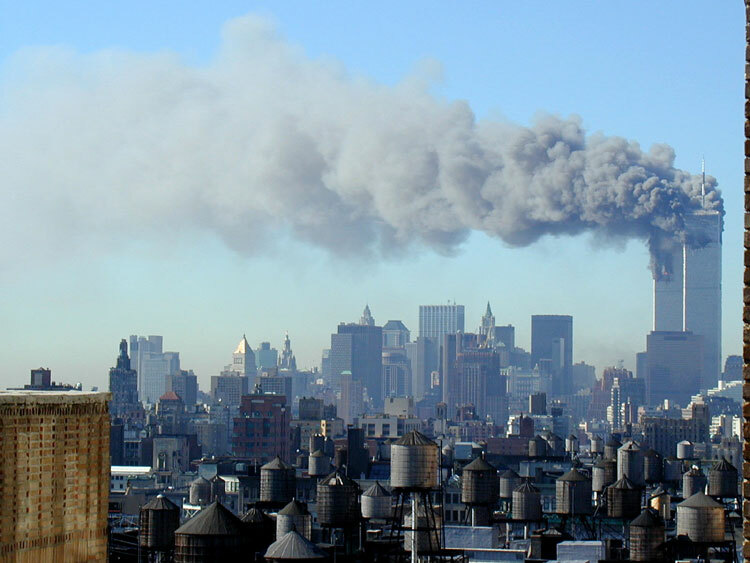 If only I could wake up once more and see the World Trade Centers from my street and be told that the planes crashing into them was just a bad dream. If only I could wake up and be assured that the buildings had not come down, and that 5,000 people were not forced to prematurely end their lives to satisfy some fanatical sense of … but what? Justice? Revenge? Freedom? There is no possible reason, no permissible explanation, for what happened. Throughout my life I have tried to see the other side of a political argument, especially where it concerns international politics, and often to the frustration of conservative American friends, but for as long as I live, I will never understand the thought process behind the so-called human beings who caused such despicable, violent deaths. But at this point (writing and editing between Friday September 14 and Sunday September 16) I don’t feel anger. I’m not there yet. I’ve been getting a constant stream of sympathetic and loving e-mails and phone calls from friends overseas – Britain, France, Australia – and, especially in the written observations, it’s evident just how scared they are that the American Government will retaliate with such ferocity as to start a new World War. To which I must stress that those of us in New York City are too busy dealing with the reality of the horrors at hand to be thinking about retribution. If anything, the closer you get to the horror of Ground Zero, the less desire there is to inflict equal pain and devastation on other innocent people. It has felt since Tuesday as if there are two different countries in existence here – the nation of 250 million seething with anger and represented by career politicians and business men in Washington, D.C. (itself suffering from the devastating attack on the Pentagon), and then a smaller nation of several million here in New York, trying to dig itself out from the rubble, emotionally and physically, metaphorically and literally. But isn’t that how it’s always been? Back when I moved to America, to a certain amount of bafflement and consternation from rabidly anti-Yank Brit associates (Reagan was still President), I used to excuse my choice by stating that “I don’t live in America, I live in New York City.” I still feel that way – and yet for the first time I am forced to confront myself as an adopted American too, and to state for the record, that I love this country. The United States of America is by its very name and nature a complex conglomeration of many different (stars and) stripes, and it has a history every bit as noble as it is occasionally regrettable. It was built on principles of freedom that necessitated ridding the country of its British overlords (and then, sadly, all but rid itself of native Americans too). It shed enormous rivers of blood to preserve that freedom for itself and other nations – especially in the two World Wars, a fact I believe the Europeans have always found hard to admit because those wars were never fought on American soil. It is a country that, especially since that last World War, has often wrongly equated the concept of continued freedom with rabid anti-Communism and pro-Christianity, and which has frequently and patronisingly imposed its sense of justice on others only to react with indignant arrogance when it isn’t immediately thanked for doing so. And yet it remains a country full of extraordinary physical beauty – from the cities to the deserts, “from the mountains to the prairies” – and exceptional kindness. It produces extraordinary talents in all fields of art and commerce. And it offers financial and creative opportunity, along with freedom of expression and religion, to immigrants on a scale simply unmatched elsewhere in the history of the planet. I don’t know I have ever met a visitor – especially a European one – whose cynicism has not been replaced by ardor following a stay here. What’s wrong with this picture? Nothing at all. 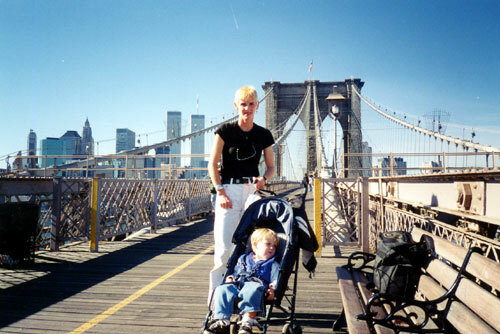 Posie and Campbell on the Brooklyn Bridge, with downtown New York and a couple of memorable buildings in the background, circa 1998. Still, anyone who lives in this city thinks of themselves as a New Yorker first and foremost, and it seems to me so unjust – I would use the word laughable if anything about this horror was funny – that Manhattan should be the target of such colossal terrorism. For there simply is no other Island on earth that, every single day of the year, packs in more people from more different countries speaking more different languages, all of them tolerating, communicating and often openly sharing love with each other. One only had to watch the sad reports from the area hospitals of people trying to find their missing loved ones to see who were the real victims of this tragedy: they were people of African descent, of Asian descent, of Arabic descent, cruelly united that day for daring that day to be American – or at least New Yorkers. 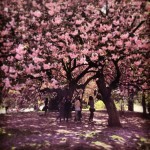 During the late ’90s, I felt a gradual distancing from the New York City I had always loved. Some of that was a result of my own lifestyle changes – retreating from Djing, nightclub promotion, constant gig-going and clubbing, to concentrate on writing, having a child and leaving Manhattan to settle in Brooklyn. (Just a mile or two over the river, but over the river nonetheless.) Some of it was due to the economic boom that saw the lower paid artistic types who had always made New York the capital of creativity shunted off to cheaper outer boroughs, their low-rent communities and inexpensive cafes replaced by high-flying young execs and stratospherically priced restaurants. And some of it, without doubt, was the result of a Mayor who, in his second term especially, declared a war on our beloved nightlife and so desperately wanted to see crime reduced to statistically impossible non-existence that he gave the police force near carte blanche with the inevitable ugly results. Knowing that life is short (oh, and how evident that is now), and how there may be other locations I could happily call home, I had begun seriously considering the possibility of moving on. But not now. Not at this moment. I have never felt more proud of being a New Yorker than I do right now, and I know the watching world understands why myself and the several other million that claim this title simply by living here should feel this way. Perhaps it’s the nature of dealing with such a stressful city on a daily basis, but New Yorkers always knew how to handle themselves in a crisis – and have now had the unfortunate opportunity to prove as much to an admiring world. The vast majority of people here proved themselves cool, calm and collected in evacuating their work places, the transport system, the schools and their houses. Firemen and police rushed into action, sacrificing themselves by the hundreds to save others. Citizens aided each other wherever and however possible. People of all ages and persuasions rushed to volunteer. The Mayor proved what was never doubted of him – that he thrives in a crisis – and set a standard for leadership that Bush could never aspire to were he to remain president for life. (And how ironic Giuliani should get to shine so brightly on the very day we were meant to be voting to choose his successor.) In my own community, I have seen phenomenal out-pourings of support in the form of donations and physical assistance; in Manhattan I have seen the young and old offer up their services in every which way they can; on the radio and television I have seen our leaders prove why we actually go to the polls and elect them. I’ve seen a city that refuses to cow down, a city that knows it will rebuild, a city whose inhabitants may have been growing further apart these last few years but who now have a common reason to come closer together again – their love of that magical melting pot known worldwide as New York, New York, so great they named it twice. My own experience of the devastation is unimpressive. I went into the bathroom around 8.45 Tuesday morning thinking about the Democratic Primary and whether to take a run in the Park before settling down to work; I emerged just twenty minutes later to hear that two planes had crashed into the World Trade Centers. Myself, at least, I was safe in my home. 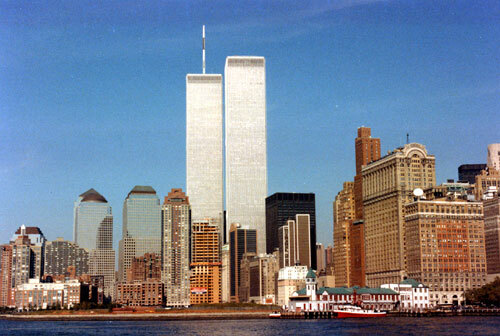 My wife Posie, however, was on her way into work, on the subway that runs directly under the World Trade Centers. That’s where she was when the first plane hit; as the subways initially continued on their journeys, people got on at the next stop bewildered and amazed, but assuming there the collision had been either an accident, or at worst some foolish suicide in a Cessna or similar. By the time she got to work, the second plane had hit with that God-awful accuracy and, as we got on the phone to each other, she took painfully beautiful photographs from her 20th floor window while we struggled to take in the reality of what was happening. 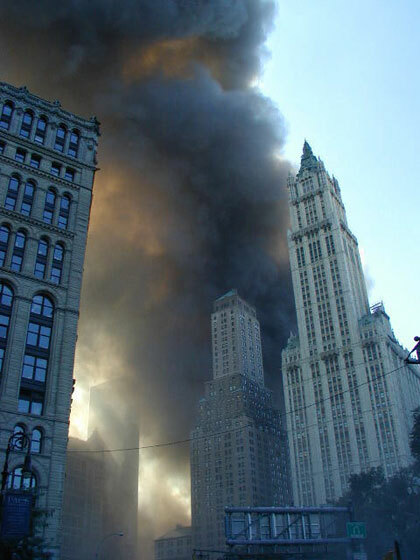 Then the buildings collapsed in front of us, me watching it on TV, her watching it out of her office window, and as news came in of the Pentagon being attacked and a further crash in Pennsylvania, I had to consider what was then a very strong possibility I might not see her again. She works next to the Empire State Building, a logical enough – and easily visible – target should there be more hijacked planes in the sky, which is precisely what the media was then telling us. The subway system was, of course, at a standstill by now. 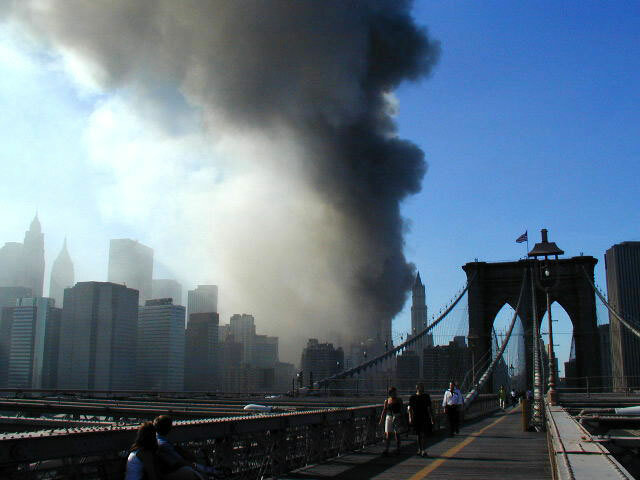 And all bridges back to Brooklyn were directly underneath that enormous thick cloud of smoke and soot and dust. Given the likelihood that the whole of lower Manhattan was going to either collapse or catch fire or indeed be blown up, we expressed our love for each other and struggled aloud to figure where she would go and how I would find her if she, like possibly millions of others, had to evacuate north of Manhattan, out to the Bronx and the suburbs beyond. So much of the past hour had already been like such a horror movie that the vision of a mass exodus back to the woods and forests from where we once emerged seemed all too real a possibility. Armageddon didn’t happen. Later in the day, with the situation under greater control, she was able to walk home, eight miles, across the Brooklyn Bridge, taking pictures as she went not out of some ghoulish curiosity, but because she often did take pictures of the city, her city as much as it is anyone else’s. For my part, after I could watch the television no longer – and that was within the hour – I went to my son’s school by bike, inhaling smoke and dust from that perilous cloud on what was otherwise such a glorious Indian Summer’s day. (No coincidence that these attacks took place on a brilliant morning of maximum visibility.) I knew my son, who had just started first grade, would be safe at his school, and indeed he was; I found him contentedly watching a movie in the Auditorium, sheltered from the school yard and the horror of what was occurring just two miles away. I stayed at school through the afternoon helping make phone calls to ensure the kids had families to go home to. I’m glad to say that they all did, even among those whose parents worked in the building. In fact, from a purely personal point of suffering, I feel bizarrely, almost guiltily, untouched by the body count. I had no immediate family or close friends (at least such as I currently know of) in those towers who were not able to escape in time. 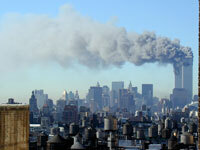 I didn’t see the planes hit or the buildings collapse with my own eyes. Neither, thankfully, did my son. (Many other neighborhood children did witness events from the windows or yards of their Brooklyn schools; I am not sure how this will affect them over coming weeks and months.) And of course, my wife knows that her own traumatic vision pales into insignificance compared to other people’s personal losses and experiences. 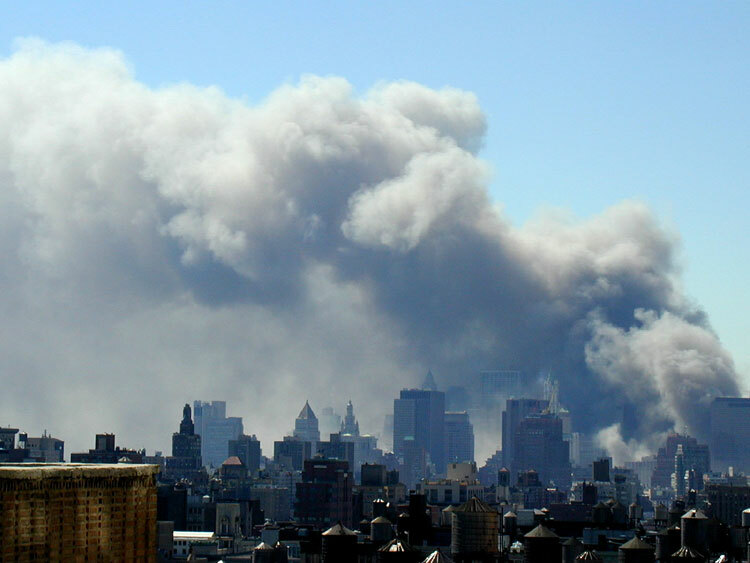 Above: The unbelievable sight from my wife Posie’s 20th Floor office balcony on the morning of September 11, 2001. The World Trade Centers on fire, and then suddenly, no longer there. Please click on the images to see at a larger size. Please do not use without permission. Copyright Posie Strenz 2001. Above: Two sad shots from Posie’s late afternoon walk home, finally, across a now near-deserted Brooklyn Bridge. The fires have been smouldering ever since. Please click on the images to see at a larger size. Please do not use without permission. Copyright Posie Strenz 2001. But as anyone who has visited this city knows, New York lays claim to being the world’s biggest village and we’re all touched by this disaster through our collective suffering. I have neighbors who are missing family, friends who are missing neighbors, neighbors who are missing friends, friends who are missing family, and so on and so ad sickening in finitum. I know that the next time I go to see an England game, many of the Wall Street contingent will be absent. Here at home, twelve members of our local fire department – Squad One, whose placement in the middle of this community, right next to the Park Slope Food Co-op, rendered them familiar and friendly faces to all – stormed into action on Tuesday morning across the Brooklyn Bridge within minutes of the first crash, and never returned. We had a candlelight parade here on Friday night and through the uncontrollable tears for them – and cheers for them too – I felt as much pride in my inadvertently chosen neighborhood as much as in my specifically chosen city. Standing outside the fire station, my son kissed away some of his mother’s tears and then told me he had said “nice things about the firemen to God in my brain.” I kissed him through my own tears and thanked him for doing so. It would be so much harder to get through this without experiencing the unconditional love and joy of innocent young children. (I do not believe we are born with sin; I believe we are all born pure.) Campbell turned six years old on Thursday. We took cupcakes into school that day for the traditional birthday celebration; it was, after all, hardly the childrens’ fault that this calamity took place and we must ensure they experience as much love as possible. It would be so much harder to get through this without experiencing the unconditional love and joy of innocent young children. Campbell and cousin Cooper one week before their world changed. I have no more idea what will happen globally in coming days and weeks than anyone else. I sense enormous fear from my European friends about Bush leading us all into a World War; I sense enormous anger and a need for vengeance from your “average” (if such a thing exists) American. But as I say, in New York, it’s too painful to get into that. We are only just now moving from complete numbness and shock into what I fear will prove an almost unmanageable grief. I understand the nation needed a day of mourning on Friday the 14th, and it especially aids us that the rest of the world showed such solidarity, but we were not yet ready for that in New York City. (A memorial in Central Park has been announced for September 23rd; perhaps then we will be able to move from grief to mourning. [It was later cancelled due to security worries.]) Even as a grown man whose personal losses are at a bare minimum, I find myself choking back tears at sudden moments, especially when talking about the losses; I have suddenly and inexplicably stopped having dreams; I woke up on Friday morning instead to find myself crying into the pillow. It’s going to get an awful lot worse before it gets better, but better, ultimately, I believe it must get. I have to maintain that hope. There are other scattered thoughts . . . How, growing up in London in the seventies and eighties, I was familiar with terrorist attacks from the regular IRA bombs, and yet how the death toll from 30 years of the Irish “troubles” was equaled in one evil morning. . . How, while Manhattan burned and thousands died, Brooklyn went oddly about its business, simply because it could. The mail was still delivered, the buses continued running, the shops stayed opened. . . How prevalent the silence has been in the subsequent days, not just because of the lack of airplanes flying overhead, not just because of less people have been going to work, but because kids have stopped playing in the street, adults have stopped playing music in their homes – my usually active stereo has been silent for days now – and largely because, when we meet strangers in the streets, we simply don’t know what to say to them, so we shake our heads in a show of mutual amazement and walk on. . . How surreal it was to visit the Brooklyn Heights Promenade on Wednesday morning, staring at that murderous cloud spewing from Manhattan where once stood those starkly beautiful Twin Towers, and how quiet it was, despite so many thousands of people …How Americans have always held an awesome admiration for British morale and courage during the Blitz, and how New Yorkers have shown how those same characteristics in fact lie just beneath our usually brittle surface. . . How I have always wished that Americans were forced to spend some time traveling during their youth to forge closer ties with the people of other countries, and how I wish that now more than ever as I hear those who have never been to New York calling upon us to bomb other cities in retaliation. . . How bizarre it was to do a run into the Drop-Off/Volunteer HQ at the Javits Center on the West Side and 34th Street and encounter what looked like an earthquake relief center, with the army directing traffic, military vehichles filling in the streets, trucks hauling mangled, dust-covered cars up the West Side, hundreds of young and old people helping sort mountains of donations into barrels as dozens more volunteers of all persuasions pleaded to be of service. . . And how I’ve hung an American flag in my window for the first time in life and what that says about me. It is a printed poster given away free in Union Square and its reads, “We will not let them destroy our Spirit! America will overcome and rebuild.” I believe in every word. How the city once looked: a snapshot I took back in 1990. But I must end this hopefully cathartic process by returning to another outdoor event from my seemingly perfect summer. In the week of its 225th Anniversary, during August, the Battle of Brooklyn was re-enacted on its original grounds – and for the very first time. Sometimes referred to as the Battle of Long Island, it was the first major battle of the Revolutionary War, and yet it tends to be ignored in the history books, not least because it was a terrible defeat for the Americans. I want to give some historical information first and I will then render it relevant to the present: With the ink still drying on the Declaration of Independence, and with George Washington struggling to correlate a functioning army, the British sent 300 warships (twice the size of the Spanish Armada) to New York Harbor to nip the Colonies’ revolt in the bud. Rather than take Manhattan, already infamous for vice and criminality, the British settled their troops among the more conservative Loyalists of Staten Island. (Nothing changes there!) Washington had many of his own troops stationed in the fort around Cobble Hill and Brooklyn Heights, also across the water from Manhattan. Battles in those days were fought between troops, in the open, and so it was that on the morning of August 27, 1776, a ragtag American army of 5,000 confronted a well-trained army of apparent equal size in what is now Prospect Park, only to be outflanked from both the rear and the sides by a further 15,000 elite British soldiers. The result was a slaughter, but as the surviving Americans retreated, a regiment of 400 volunteers from Maryland repeatedly and relentlessly attacked British units at what is now known as the “Old Stone House” on Fifth Avenue and Third Street so as to give the remaining Americans an opportunity to retreat across the Gowanus Creek. In doing so, 256 of those Marylanders laid down their lives in front of that then remote Stone House. By the time the retreat was fully finished, less than ten of the Marylanders had made it. So thorough, in fact, was the British victory that day that rather than attack the American fort at Brooklyn Heights and finish the rebels off, the British commanders prepared Terms of Surrender they assumed would be readily met; yet the following night George Washington managed to withdraw his entire remaining army across the East River into Manhattan in rowing boats under cover of fog, an amazing and fortuitous retreat every bit as important for the future of the planet as the more visible retreat from Dunkirk in World War II. The Americans lived to fight another day – and another. And another. Though he was rapidly chased up the Hudson river, Washington gradually turned the disorganized volunteers from competing States into a trained Army. The battle for independence went on for several more years. 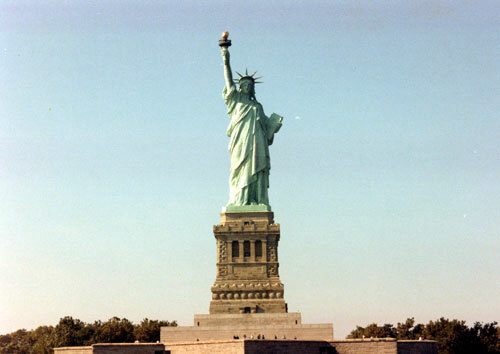 But eventually it was won and a new and great nation – The United States of America – became a reality. I am no student of military history. I don’t revel in war. I wish man never had to fight his fellow man. But I attach great personal relevance to the Battle of Brooklyn. For one, it was fought more or less on my street, and one should always know one’s local history for fear of otherwise repeating it. For another, it was fought between the Americans and the British – two nations so firmly allied these days that it seems unfathomable to imagine my birth nation slaughtering people from my chosen home. It helps to be reminded that yesterday’s enemies – the British and the Americans, in this instance – will almost inevitably become tomorrow’s allies, and that we should never hate the entire people of any other nation, because we will ultimately find that we have more in common with them than we have that which separates us. It’s important for me to know that my birth nation, Britain, has a past every bit as imperfect as any other country I could care to mention, and that the U.S.A was a prototype for freedom. It helps that I am reminded there was once a time when war was confined to the battlefield, between clearly visible enemies with stated goals and written claims, and was not targeted at innocent people by cowards who will not declare or admit themselves. Perhaps most importantly, I have frequently marveled at those 400 volunteers from Maryland who bravely laid down their lives to save so many others – as did a similar number of firemen and police this September 11 – and thereby keep alive their dying dream of a free nation. When I stand on the children’s playground that surrounds the (replicated) Old Stone House, or have a pint at the English-style pub opposite, it is almost impossible to imagine over 250 American bodies lying dead on the ground in front of me. But imagine it I often have done – both to understand the sacrifice they made for this nation to become free, and to remind myself of the horrors of war and how fortunate I am never to have experienced it firsthand. Some twelve hours of fighting between 25,000 troops that long day 225 years ago brought a combined death toll stood of around 2300, probably the biggest single daily loss of life New York City ever expected to endure; yet in just an hour and a half on September 11, more than twice as many people were eliminated – all of them innocent civilians who went to work with no idea that they were about to become casualties of war. And so. . . I now have a much more personal experience of the horrors of war than I ever desired. I pray for peace. For all of us, all around the planet. And I hope that such horror never be inflicted on innocent people again, anywhere in the world. If September 11 proved anything, it proved how small this planet really is, how closely tied we all are, and how united we must stand. Not as one country, or one race, but as one species, one people. May peace be with all of you. Tony Fletcher, Friday September 14 through Sunday September 16, 2001.